Think video gaming isn’t a real sport? Robert Morris University respectfully disagrees. This week, the Illinois college announced it has begun offering athletic scholarships to high-school aged players of the popular League of Legends online video game. Students picked to participate in the new scholarship program will receive up to 50 percent of their tuition, room and board – about $19,000. The school is seeking to recruit three teams of nine players each to battle players at other schools. "Robert Morris University has always been at the forefront of providing opportunities for a diverse student population with different interests and skills," states RMU Associate Athletic Director Kurt Melcher. "League of Legends is a competitive, challenging game which requires significant amount of teamwork to be successful." League of Legends is currently the most played PC title in the world, with gamers cumulatively logging over 1 billion hours of play annually. The game owes much of its success to three crucial factors: it’s free to play, it’s fun to play, and it offers massive prizes to the best players in the world. Indeed, just last October, the five-player professional gaming team SK Telecom T1 won Riot’s League of Legends Season Three World Championship and its $1,000,000 grand prize. More than 32 million people from around the world tuned in online to watch the tournament. And if you need any more proof that “e-sports” are legitimate, consider this: The U.S. government now issues pro gamers the same type of 5-year athletic visas it offers players of more traditional games like baseball and soccer. For more on Robert Morris University's new video gaming scholarship, visit the RMU website. 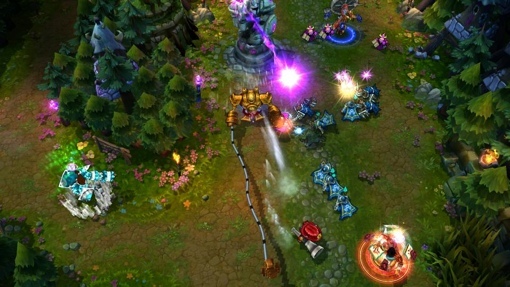 For more on the game itself or to download the free software, visit leagueoflegends.com.